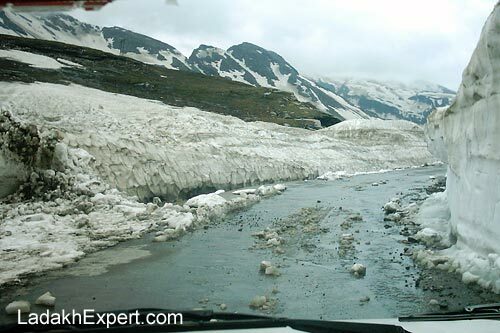 BRO has managed to clear snow from the road to Rohtang Jot and is expected to throw open the pass to public in the first week of May 2013. This is due to the fact that BRO is trying to repair some of the road and stabilize it, before it lets tourists on to the pass. However, taxis from Manali, carrying passengers to Lahaul Valley are already crossing Rohtang Jot illegally at night and in a way, hampering BRO operations to some extent. BRO still has to clear and stabilize Baralacha La and Tanglang La, before the Manali – Leh Highway can be reopened for 2013, which is expected to happen by the middle or end of May. As always, we will keep a track of all that is happening and you can be sure to get up to date and accurate info on LadakhExpert.com, so watch don’t forget to subscribe to our RSS feed and follow us on Twitter.